Components used in any system are subjected to various actual or probable forces. It can be the atmospheric pressure that acts on the fuselage of an aeroplane, or the tension that acts on the cable of a suspension bridge or any other application where a form of force acts on the system. While designing such components, it is important to make sure that it serves the function without adding extra material. Extra material adds unwanted expense and weight to the component, both of which are undesirable. Mechanics of Solids or Strength of Materials uses analytical methods for determining the stiffness, strength and stability of any component which are subjected to various loads. The history of Mechanics of solids dates back to the days of Leonardo da Vinci and Galileo Galilei. Significant contributions to this field of engineering or science have come from Coulomb, St. Venant, Navier, Poisson and Cauchy. Mechanics of Solids has numerous applications in the domains of Civil, Architectural, Nuclear, Mechanical, Chemical and also Electrical engineering. When external forces act on a body, internal forces arise within the body to resist the deformation. A measure of this internal resistance is stress (𝝈). The deformation induced on the body due to the action of such external forces is called strain (ϵ). Further, stress can be categorised as various types on the manner in which it acts on the object in consideration. Consider a cylindrical rod of any material, let’s say mild steel. Fix one of the ends and then pull the other end along its central axis. On doing so, you are putting the object in a state of tension and thereby you are inducing tensile stress within the body. If you are pushing the end which is not fixed along its central axis, then you are putting the object in a state of compression and thereby inducing compressive stress within the body. Strain is the ratio of the linear change in length, ΔL to the original length L. This happens in a scenario where a load P acts on any specimen with a cross sectional area of A, which results in a stress σ. Stress is defined as the average force per unit area that some particle of a body exerts on an adjacent particle, across an imaginary surface that separates them. The state of stress at a point can be completely defined using the stress tensor which is a second order tensor with the nine components of 𝝈ij. The stress on a particle can be regarded as the sum of normal stresses (tension and compression) that is perpendicular to the surface and shear stress that is parallel to the surface. A body is said to be in a state of equilibrium when the external and internal forces are balanced out. Similarly, when considering stress on the cut section of any body, the externally applied forces to one side of the cut section must be balanced by the internal forces at the cut section. Strain (ϵ) can be further classified as linear, lateral, volumetric or shear strain. The change in the physical dimension of a specimen when considered along the direction of application of force is known as linear strain. When the variation in physical dimension is considered on a plane perpendicular to the direction of application of force, it is known as lateral strain. Volumetric strain is defined as the ratio of the change in volume of the body to the deformation to its original volume. It means that volumetric strain of a deformed body is nothing but sum of the linear strains in three mutually perpendicular directions. The strain accompanying a shearing action is known as shear strain. The stress strain relationship of any material is of primary importance as it gives a good idea of the mechanical behaviour of the material in real life conditions. This is generally accomplished using the tension-compression tests. Where, A0 is the area of cross-section and P is the applied load. 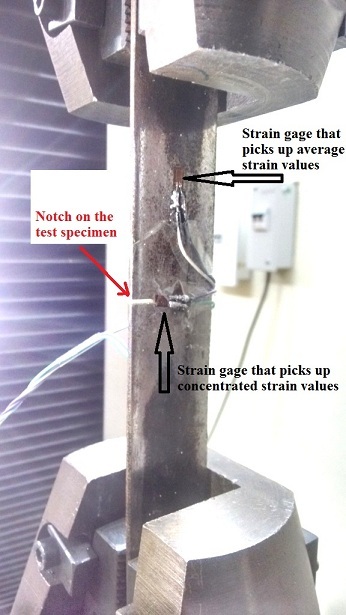 Similarly, the nominal or engineering strain (ϵ) is found using the strain gage reading or by diving the change in gage length (ΔL) by the original gage length of the specimen. After this, the values of stress and corresponding ϵ are plotted graphically with strain values on the x-axis. This diagram is known as the stress-strain diagram. In the stress strain curve, from the origin to a certain limit, the change in strain is proportional to the stress which produces a linear straight line in the initial portion of the stress strain curve. This region is said to obey Hooke’s law. For glass, at room temperature, this holds true for the entire region. For material such as concrete, there is hardly any region where it exists. For mild steel, it is true up to some point. The point up to which the material obeys Hooke’s law is termed as the yield point. For mild steel, this point can be clearly observed and a yield plateau follows it where strain happens for little or no stress. Then the region of strain hardening follows till the point of ultimate tensile strength which is practically the highest value of stress the specimen can endure. Necking follows this where the specimen displays significant lateral strain. Where the constant of proportionality is Young’s Modulus or Modulus of Elasticity represented as E. Since strain is dimensionless, E has the same units of stress which are newtons per square meter (Pa, pascals - SI units) or pounds per square inch (US standard). Physically, E represents the stiffness of the material. It can be obtained from the stress strain graph by measuring the slope of the initial linear portion. For all steels, the value of E ranges from 200 to 210 GPa. This is generally defined for isotropic materials where the properties remain constant when considered across the entire cross section of the specimen in all directions. For anisotropic materials such as wood, the properties vary a lot and this is not true. For linear elastic material, the loading and unloading happens across the same path when tested up to the elastic point. Beyond this, a phenomenon called hysteresis comes into play where the return loop is offset by some amount. When solids are put into tension or compressed, there is an overall deformation in the transverse as well as lateral dimensions. That is, if the solid is compressed, the transverse dimension reduces but the lateral dimension increases. Similarly, if the solid is put into tension, the lateral dimension decreases and transverse dimension increases. The ratio of lateral strain to axial or transverse strain is known as Poisson’s ratio (ν). This is generally observed in the plastic flow region and signifies the aspect of constant volume. The tension test is carried out using a Universal Testing Machine (UTM) which can test the specimen by putting it in tension or compression. The American Society for Testing and Materials (ASTM) has published standard guidelines for performing Tension tests on sample specimens that will help determine the application limits of materials. ASTM E8 lays out tension testing methods to determine the tensile strength, yield strength, yield point elongation, elongation and reduction area of various metal samples. While conducting a tension test, the portion of the specimen with uniform cross section is marked out as gage length. The change in gage length is recorded as a function of the applied load on the specimen. To measure this change in gage length, we can use an extensometer or a wire strain gage. The ratio of increase in length (ΔL) to the original length (L) is termed as the strain. These electric strain gages are generally expendable in nature. These tiny strain gages are glued on to the surface of the specimen in consideration. As the specimen elongates or contracts on application of the load, concurrently the strain gage is also affected and this change in length of the thin wires alter the resistance, which can be measured to get the magnitude of the change in the physical dimension of the specimen. Normal strain is the strain that is normally associated with normal stress. Since strain is a ratio of length by length, it is a dimensionless quantity. But still the value of strain is measured as microstrain (μm/m), mm/mm, in/in or m/m. Generally, the quantity of strain (ϵ) is in the order of magnitude 0.1%. The load applied by the UTM is measured using a Load Cell which is a force transducer. The transducer when subjected to an external load deforms a strain gage within. The deformation is reflected as a change in the electrical resistance. Depending on the number of strain gages used, the load cell is categorised as Quarter Bridge (one strain gage), half bridge (two strain gages) or Wheatstone bridge (four strain gages). The output is generally measured in millivolts which can be amplified using instrumentation. The same principle is used in a piezoelectric load cell where a piezoelectric material is used. Here, the deformation on the material produces a voltage output. Further, various types of other load cells are also in use such as capacitive load cell, hydraulic load cell and pneumatic load cell. The Mohr’s circle is a two-dimensional graphical representation of the transformation law for the Cauchy Stress tensor. Upon performing a stress analysis on a material body assumed as a continuum, the components of the Cauchy stress tensor at a particular material point are known with respect to a coordinate system. The Mohr circle is then used to determine graphically the stress components acting on a rotated coordinate system. On the horizontal axis, we take the values of normal stress ('sigma'n) and on the vertical axis, we take the normal shear ('tau'n). The notch experiment involves finding the stress concentration around a horizontal notch (slit). where Kt is the stress concentration, P is the load applied on the specimen, t is the thickness of the specimen, W is the width of the specimen, a is the length of the notch. From this we can observe the manner in which the stress concentration at the notch on the specimen varies with increase in loads.